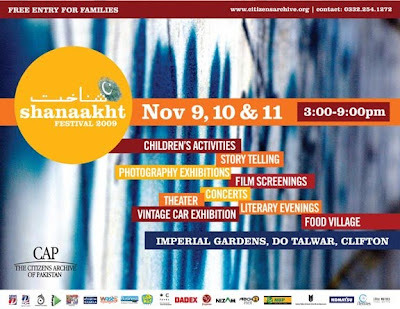 The Citizens Archive of Pakistan: Shanaakht Festival returns to Karachi! Shanaakht Festival returns to Karachi! Open to Schools between 9 A.M. – 1 P.M.
Free and Open to the Public between 3 P.M. – 9 P.M.
cityscape through an architect’s eyes. Story-telling: Pakistan’s Partition-Generation tell their stories of how they laid the foundation for the new nation of Pakistan during the 1940s and 1950s. This evening Ms. Anita Ghulam Ali will discuss her career in education, recollections of Karachi and some memorable personalities she has encountered. Theater: A satirical play with live music about corruption, hypocrisy and religious obscurantism. Tehrik-e-Niswan explore the present state of Pakistan. Story-telling: Pakistan’s Partition-Generation tell their stories of how they laid the foundation for the new nation of Pakistan during the 1940s and 1950s. This evening, we delve into Pakistan’s legal history, life in the police force and memories of Quaid-e-Azam. Literary Evening followed by Musical Performance: The Citizens Archive of Pakistan and Still Waters Publishing explore Pakistan’s rich literary landscape, as six renowned writers including Fahmida Riaz, Haseena Moin, Ilona Yusuf , Mohammad Hanif and Musharraf Ali Farooqi read their favorites from Pakistani literature in Urdu and English. The evening concludes with a musical performance by Laal. Story-telling: Pakistan’s Partition-Generation tell their stories of how they laid the foundation for the new nation of Pakistan during the 1940s and 1950s. This evening we revisit Dhaka and discuss the field of journalism. The Citizens Archive of Pakistan is a not-for-profit educational institution and heritage centre established in February 2007 with the aim of allowing Pakistanis to explore their heritage and history. We are a voluntary society dedicated to commemorating the collective and individual experience of our rich history across all segments and communities of Pakistan. Our vision is to develop CAP as the foremost library and museum of Pakistani history, art, photography, culture, literature and historical documentation demonstrating the strength and spirit of Pakistan from the citizen’s perspective.